Thank you for your interest in working with Worthing Coaches. 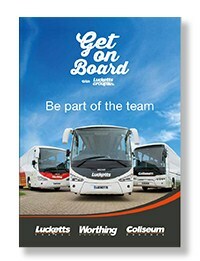 Worthing Coaches based in Worthing is part of the Lucketts Group; established in 1926, Lucketts Travel is a family run business in Fareham, Hampshire which provides luxury coach hire and first class holidays and day trips to tens of thousands of satisfied customers every year. From small beginnings we've become the leading coach operator on the South Coast. We currently have over 300 employees, a fleet of more than 130 modern, luxury coaches, buses and people carriers and we're continuing to grow our business. National awards and top rated accreditations reflect our determination to always exceed our customers expectations. We know that its important to have the right people working with us to ensure Worthing Coaches and the Lucketts Group can continue to deliver great service to its customers, that's why we ensure our employees across all areas of the business have the right tools and conditions to undertake their role. Whether you already have a PCV licence, or are looking for a complete change of career, we'd like to hear from you. There are numerous types of driving that you can undertake with the Lucketts Group, both in the UK and across Europe. Our in-house training academy can provide you will the skills youll need, including gaining your Passenger Carrying Vehicle (PCV) licence so that you can get behind the wheel of any one of our extensive fleet of vehicles. The Lucketts Group has earnt a reputation for providing passengers with the very best service, and we rely on our drivers to help us continue to deliver this. So if you love driving, have a patient and responsible attitude and great customer service skills wed love to welcome you on board. Want to know more about being a driver for the Lucketts Group? Find out more about the types of driving, training and benefits here.